I utilize four main types of x-rays to help evaluate areas not visible otherwise. Certainly not every person will have each of these types of x-rays. X-ray intervals are determined by your risk. 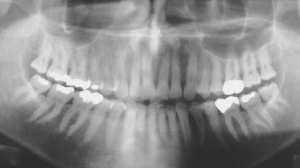 If new cavities or gum problems are detected, your risk for problems detectable by x-rays is greater and the interval should be shorter, otherwise the interval can be longer because of a lower risk level. 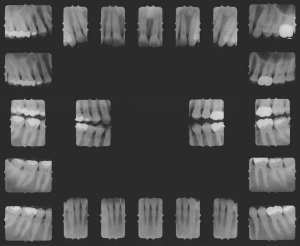 I make sure that every patient has some form of x-ray showing the whole mouth as a baseline to compare against in future examinations. I do not treat without x-rays – this is for your health. I only diagnose from original x-rays. This is for a number of reasons, foremost being your health. By law, original x-rays are to be retained by each dental office – so only copies get forwarded. If something is to be detected on x-rays, it is best detected from an original, not a copy.